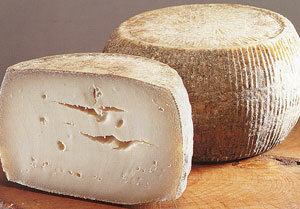 Graviera is one of the most popular cheeses in Crete. It is a hard cheese wtih a light yellow color, and has a slightly sweet and nutty taste. The Cretan version (there is also a graviera made in Naxos) is made with sheep milk, or sheep milk with a small amount of goat milk. It is aged at least 5 months before coming to market. Salt content cannot be greater than 2%. Of all Greek cheeses other than feta, graviera is probably the easiest to find outside Greece. It is sold in wheels (or wedges from wheels) at large grocery stores, Greek and ethnic grocers, and specialty cheese shops. It can also be find online. One of the reasons graviera is so popular is that, like feta, it can be used in many different ways: as a table cheese served as an appetizer, saganaki (fried) or roasted, in cooked dishes (especially au gratin), and as a grated cheese.